Although women were restricted from where they could learn how to be an artist up until the late 19th century in America, many women became professional artists. One of the media in which an increasing number of women participated was printmaking. Printmaking was seen as an extension of painting, but was not appreciated as a “fine art.” Actually, it took until the 20th century for printmaking techniques to be considered fine, stand-alone works of art (this despite the “renaissance” in etching that took place in the 1860s). Primarily, throughout the nineteenth century, printmaking was seen as a way of copying paintings for mass consumption, for advertising, and for illustration. Interestingly, many women took up printmaking as a way of artistic expression within the narrow confines of what was deemed “appropriate” subject matter. What we in the 21st century do not often think about is how these women, deprived of the gallery, academy, and museum network that men had, persevered and have left us a glorious body of work. Chromolithography, like color woodcuts, involves the use of multiple surfaces with the same design, in lithography’s case a stone, on which the various colors are printed on the paper containing the original neutral design. Like color woodcuts, the printer had to be careful to line up the base print with each color so that registration of the colors would be exact. Ellen Thayer Fisher was the older sister of American Impressionist/Tonalist Abbott Henderon Thayer (1849–1931). Although it is theorized that Fisher “learned” art from her younger brother, it is most likely that she was a self-taught artist. Her father was a country doctor, and while her brother went to New York to study art, she remained in remote New Hampshire, studying landscapes and flowers as subject matter. While Fisher’s primary medium was watercolor, she, like many of the women artists in remote areas of the Northeast, succumbed to the numerous recessions in the American economy that occurred between the 1870s and 1890s. With demand by patrons decreasing for original watercolors that could cost five dollars, they resorted to either coloring other artists’ prints, or having their own work lithographed. Fisher supplemented her income by producing beautiful works such as this for greeting cards, place mates, and other items that could be bought for as cheaply as twenty-five cents. 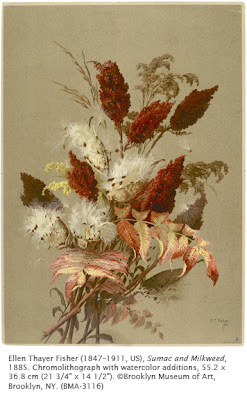 Nonetheless, this beautiful color lithograph shows all the sophistication of fellow nature artists such as Fidelia Bridges, Elizabeth Lyman Boott, Sarah Wyman Whitman, and Bertha Jaques. When she moved to Brooklyn after marriage, Fisher continued to produce watercolors of flora and also gave artistic instruction from home through the mail. Activity: Using color pencils, pastels, or markers, recreate this still life by using simple geometric shapes and primary and complementary colors. Remember that the basic geometric shapes are the circle, the square, and the triangle.